An estuary is a long bay that opens onto the ocean. It also has a source of buoyancy, like the freshwater that comes from a river, and it needs some energy to mix the ocean and river waters. This energy usually comes from tidal currents. With these three ingredients: ocean water, river water, and tidal mixing, estuaries around the world perform a rather amazing trick - developing an "estuarine exchange flow" that persistently pulls ocean water in through the deeper part of the channel, and sends a mixture of ocean and river water back to the ocean in a surface flow. 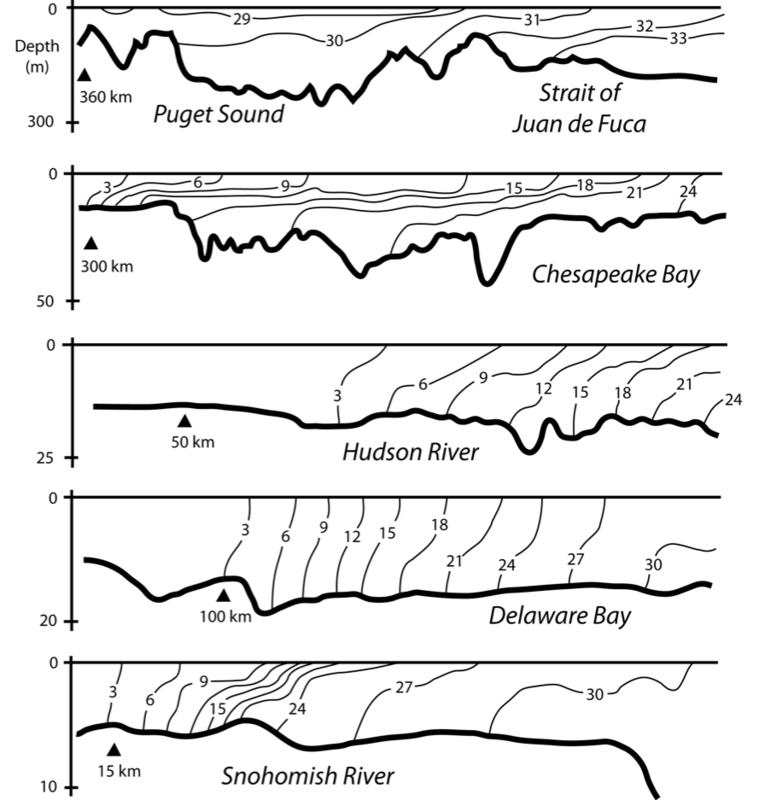 This exchange flow can often be surprisingly big - for example in Puget Sound it is 20 times bigger than the sum of all the rivers! This means that the exchange flow has a dominant influence over residence time and water quality in an estuary. Here we give an introduction to the physics behind the estuarine exchange flow. The plots above show observed sections of salinity versus depth and along-channel distance for five different estuaries. The ocean is always on the right, and the river generally enters on the left. The numbers on the contours are salinity in "parts per thousand," so 30 means there are 30 kg of salt in 1000 kg of salty water. Salty water is denser than fresh water, and the force of gravity makes the salinity layers want to flatten out, just like the layers of oil and vinegar in salad dressing. If you look a the vertical and horizontal scales for each section you can see that they are very different, yet all of these sysems share some similarities: they gradually get saltier from the river to the ocean end, and they have some vertical stratification (a lot for the Chesapeake, and only a little for its neighbor Delaware Bay). The stratification is important becasue it separates the surface water from the deep water. This allows for example bottom water to become hypoxic (low in oxygen) even though surface waters might have a lot of oxygen. 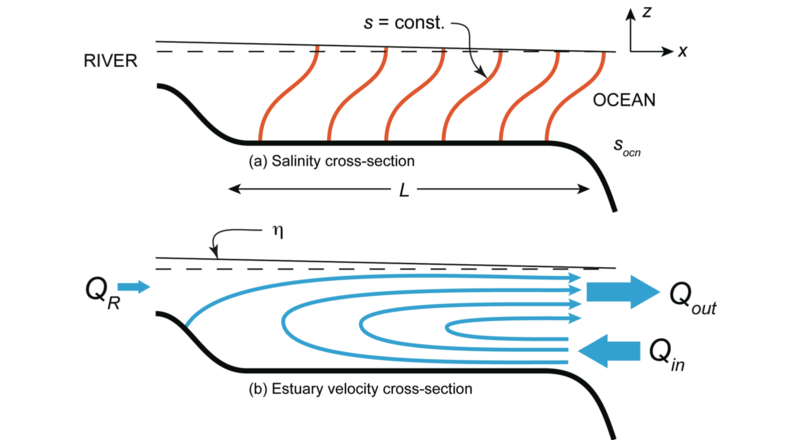 The plots above show a conceptual sketch of estuarine salinity structure (top) and tidally averaged circulation (bottom). The salinity structure is just an idealized version of the observations from many estuaries, like the five we plotted at the above. The "circulation" shows that deep water is being pulled in from the ocean, and gradually rises up to join river water and flow back out to sea near the surface. The transports of these three flows are given by Qin, QR and Qout which are volume transports (cubic meters per second). The circulation shown above is "tidally averaged" meaning that it is what we find after averaging over several tidal cycles. The tidal currents are often very strong, like 1 m/s sloshing back and forth, whereas the tidally averaged currents may be much smaller, like 0.1 m/s. What makes the tidally averaged currents so important it that they are persistent, always pulling deep water into the estuary, and sending surface water out. We call the tidally averaged circulation the "Estuarine Exchange Flow" becasue it efficiently exchanges water with the ocean. Typically Qin and Qout are several time larger than QR. In Puget Sound the annual average river flow QR is about 1000 m3/s, but Qin = 20,000 m3/s and Qout = 21,000 m3/s (note that the outflow is the sum of the two inflows). So, why is there an estuarine exchange flow? Why would deep water flow in persistently when the main forcing from the river is always pushing water out? The physical process is shown separated into three steps in the panels above. The river is an essential ingredient because it introduces stratificaion to the system. The tides are another essential ingredient because they mix the buoyant water downward, giving it more potantial energy that can be turned into the kinetic energy of the exchange flow. The final step is the tendency of the stratified water to want to flatten out its density (salinity) layers. In flattening it has to drag more ocean water in to replace the mixed water going out. The reason the exchange flow can be so much larger than the river flow is that the mixing means that much of the water going out is ocean water, which then must be replaced. 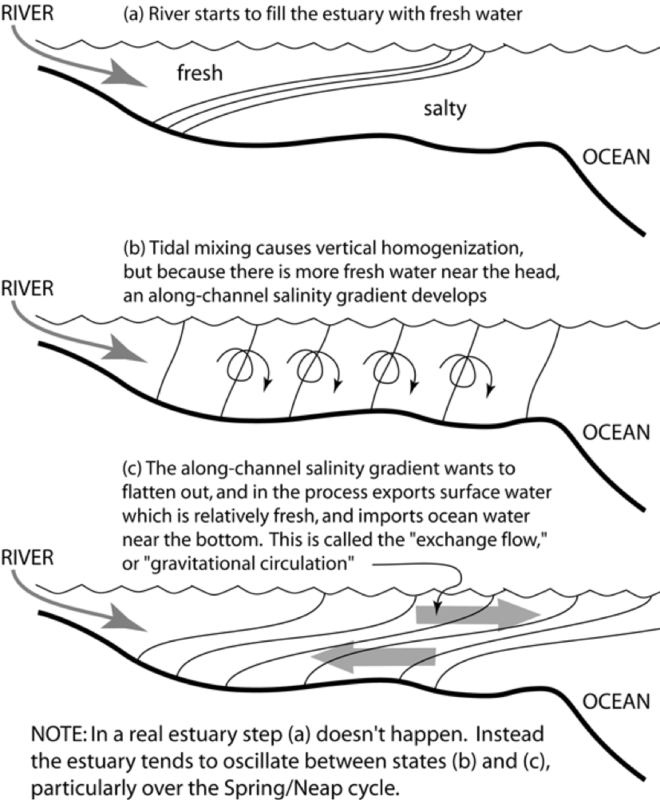 An example of an observation of the estuarine exchange flow is shown above. This shows tidally averaged currents versus depth at Admiralty Inlet, at the seaward end of Puget Sound. The negative currents in deeper water are the inflow, and the positive currents near the surface are the outflow. The profiles show greater exchange flow neap tides when there are weaker tidal current. This is becasue the water is less turbulent then, and so there is less effective friction acting on the currents. 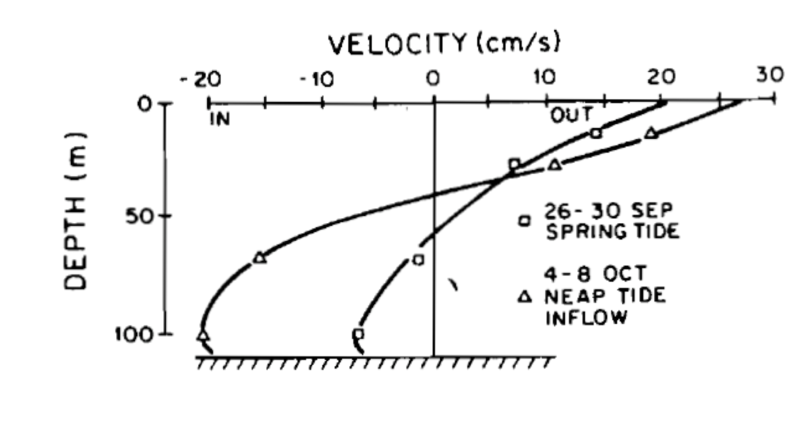 These observations are from: Geyer, W. R., and G. A. Cannon, 1982: Sill processes related to deep water renewal in a fjord. J. Geophys. Res., 87, 7985–7996, a classic paper. MacCready, P., and N. S. Banas, 2011: Residual Circulation, Mixing, and Dispersion. Treatise on Estuarine and Coastal Science, Vol. 2 of, Elsevier, 75–89. MacCready, P., and W. R. Geyer, 2010: Advances in Estuarine Physics. Ann. Rev. Mar. Sci., 2, 35–58.